Lenovo is showing off their new ThinkVision monitors at CES. 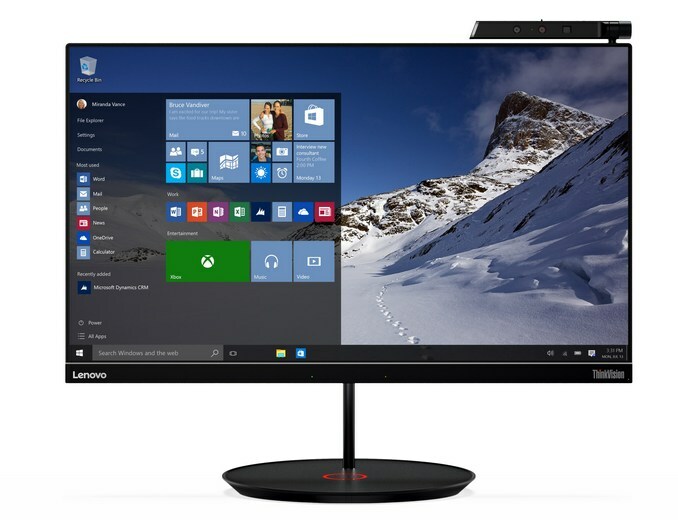 Their ThinkVision X24 Pro monitor flaunts a 1920×1080 almost borderless IPS screen. It also comes with a USB-C port and a miniDisplayPort to connect the monitor to your computer. If you want to get rid of those pesky old wires hanging behind the beautiful monitor, opt to add their WiGig bar to connect a laptop which also supports WiGig. Some of the available laptops would be Lenovo’s very own ThinkPads. Kicking it up another notch, the X24 Pro also offers an additional Qi wireless charging base to charge your Qi-enabled devices right under the monitor. This should save you space on your desk and another socket open for use. Up top, the X24 Pro offers an Intel RealSense 3D camera, perfect for using the Windows Hello facial recognition to quickly login to Windows. The speakers bundled with the ThinkVision X24 Pro are two 3watt speakers and its ears are noise cancelling dual-array microphones. These should be great for video calls and webcam chatting. Pricing for the ThinkVision X24 Pro will start at $399, the WiGig bar at $250 and the Qi wireless charging base at $150. Shipping should start at around May 2016.